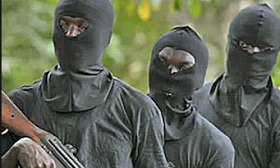 Armed robbers on Friday invaded a branch of First Bank Plc located at Amaraku Main Market in Isiala Mbano Local Government Area, Imo state, stealing millions of naira. The attack, which was said to have started at about 2:30 pm, lasted one hour and 30 minutes. An eyewitness told a Punch correspondent that over eight gunmen, who were said to have arrived in an SUV, quickly cordoned off the bank premises and robbed customers and workers of the bank. Sunday Punch learnt that the armed robbers disarmed security men attached to the bank and immediately shot into the air to scare away customers making use of the automated teller machine. According to the eyewitness, while some of the robbers blocked the Owerri-Okigwe Expressway, shooting into the air sporadically throughout the period of the attack, other members of the gang were strategically positioned inside and outside the bank premises. The gunmen in the banking hall were said to have commanded the workers and customers to lie down, before ordering members of staff to lead them to the safe. The source added that the armed robbers, who operated without the intervention of any security agency, carted away bags stuffed with millions of naira. The robbers were said to have destroyed gadgets and other properties of the bank in the process. At least five million naira was believed to have been stolen by the armed robbers.